I absolutely love certain scents. There’s nothing quite like the scents of fall either. Cinnamon, clove and more all mesh together to create a scent mix that we’re all familiar with and that screams changing leaf colors and bonfires to most of us. What I don’t love though are expensive air fresheners that only serve to put fragrance in the air for a few seconds then dissipate. Worse than that, they are filled with so many chemicals and when you spray them into your home? Guess what? Your home fills with those same chemicals. They’re super expensive too and that really is the deal breaker for me. Because there is no need to pay for expensive air fresheners or be around all of the chemicals when you can make one at home that smells better and is so much more budget (and health) friendly! 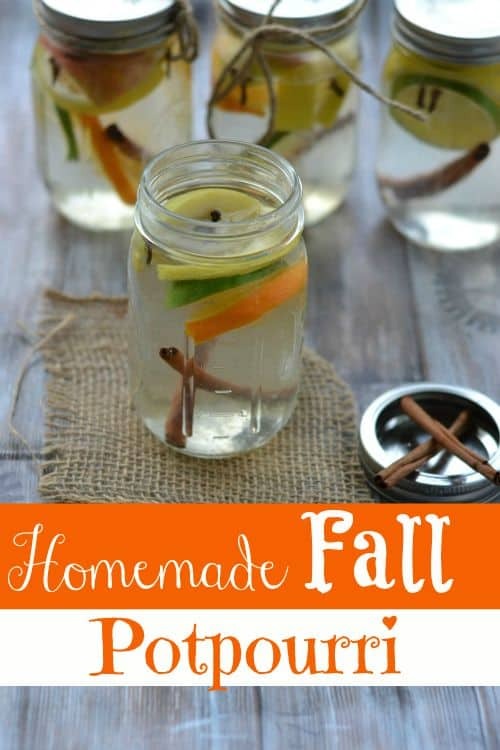 This homemade fall potpourri is perfect for anyone who wants to bring a little bit of fall into their home and not spend a ton doing it! 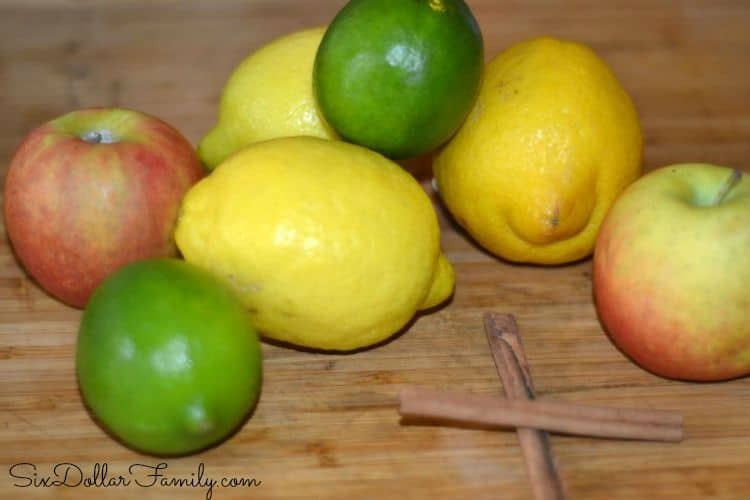 For me, the best part of this homemade air freshener recipe is how simple it is to make. It really is as simple as cutting a few things up and that is about it. Know what that means right? Since it’s so simple, there’s no reason not to use it! 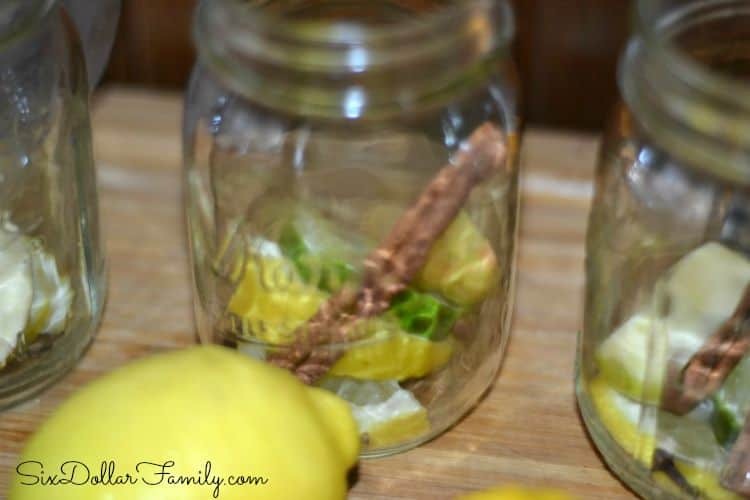 You can reuse the ingredients in each jar too. I reuse one jar a few times. They also make really nice gifts too if you know that the receiver will be able to use them quickly. Slice all of the fruits into medium sized slices then divide evenly into each mason jar. Add 2 cinnamon sticks and 2 cloves to each jar as well. Fill each jar with water and replace the lid with ring. Store in the fridge for up to 10 days. When you are ready to use pour a jar into a small sauce pan and place on low heat. 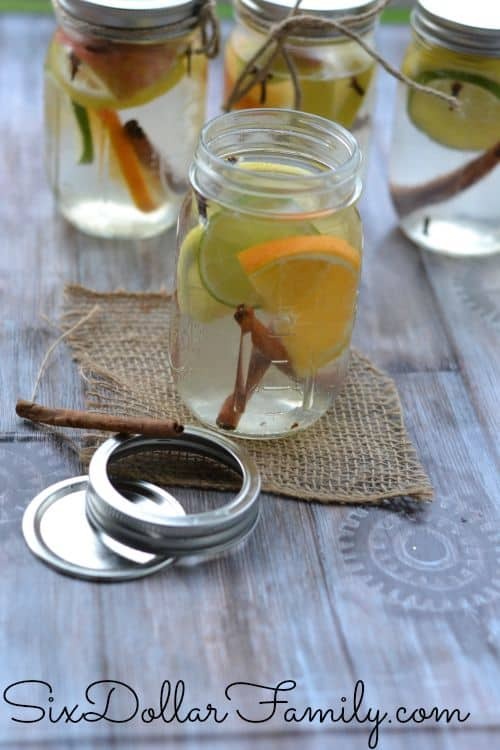 Refill the water when it runs out to reuse the fruit, cinnamon and cloves. If you’re looking for a nice table centerpiece, prepare them ahead of time then add a floating candle on top. They look fantastic on a fall themed table!